I went down to Belle Isle Aquarium one day. I knew it was closed but I was overcome with nostalgia. Nostalgia turned to sadness as I peered through the glass doors. No people or fish, just empty halls and empty tanks. Not at all like I remembered it as a kid. I went home with a pic I took and wrote a small poem which later became the blog post: “Motor City History”. Weeks later while relaxing at home, I received a text from good friend and Motown Writers Network founder, Sylvia Hubbard that brought a smile to my face. The text read: Belle Isle Aquarium receives $45,000 Historical Preservation Grant with a link to the story. Overjoyed, I rushed to show my wife the text! My prayers were answered in a small way. The grant is by no means enough to re-open the Aquarium but it will put a new roof on it! A new roof is the first step getting the aquarium re-opened. I pray the remaining steps for re-opening come soon after! Without Belle Isle Aquarium, there would be no Shark Reef at the Mandalay Bay in Las Vegas. There would not be a show on Animal Planet called “Tanked” either. 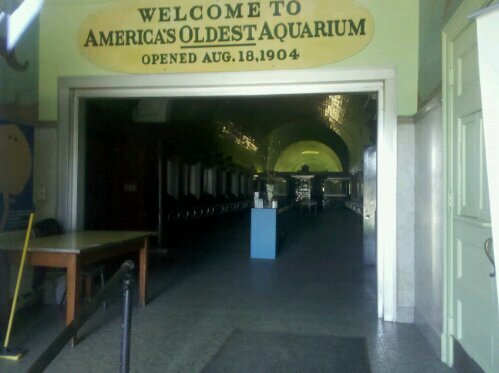 Quite frankly, if you see a fish tank anywhere in America, it is because Belle Isle Aquarium helped in starting it all. Re-opening the aquarium would be our way of saying ” Thanks!”. Holla if you hear me! Posted on September 15, 2011 by KELLY GREENE	• This entry was posted in Uncategorized. Bookmark the permalink.